Mat Goggin and Rhein Gibson are so close they can almost smell it. The Australians pair, who have played so well on the Web.com Tour this year are perilously close to earning their ticket to “The Big Show” the US PGA Tour in 2016. Gibson (27th) and Goggin (28th) have four events left to worm their way into the top 25 and guarantee they will have status on the PGA Tour next season. Victorian Steve Allan is not without a chance either, but sits back in 34th spot and would need a massive performance to surge into that elite top 25. It has been a long year for Tasmanian Goggin, who played in the final round of the British Open with Tom Watson at Turnberry a few years ago. Goggin won the first event of the calendar before suffering a mini form slump which saw him miss eight cuts in a row. 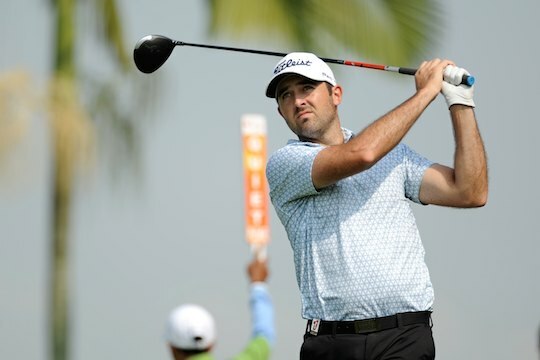 He missed the cut again last weekend but knows what it takes to mix it with the best players in the world – Goggin has played 10 seasons on the PGA Tour in the past 15 years and is desperate to get back another shot at the big dollars. Gibson, who finished 71st last weekend, just wants to take the next step in a career that has been on an almost permanent upward trajectory. Previously best known for his world record score of 55, which he shot in 2012 in the US, the 29-year-old has proven a talented player who has achieved at every level of the game. Having earned his Web.com Tour card last year he has shown flashes of brilliance in 2015 to put himself in a position to advance to the PGA TOUR where it would be no surprise to see him achieve ongoing success.